The screen size changes to 480 x 272 . The change can be easily edited in the HardwareProfile.h and all graphics primitives will scale automatically. The display used is not “mobile”, as in, it does not include a smart controller with all the RAM required to support a complete graphic frame, but only a basic rows and columns driver is present “on glass”. 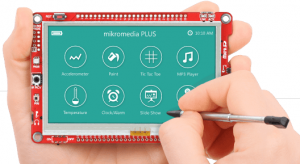 An SSD1963 display controller chip is mounted directly on the mikromedia plus board and it interfaces to the PIC32 via the PMP in 16-bit mode. This required me to port quickly a new graphics driver: SSD1963.c for the occasion. The same SSD1963 controller is driving the display backlight circuit, so the early examples in the book become perhaps a bit easier than in the PIC24 original as the whole dimming functionality is practically given. More interesting is perhaps the new touch screen, that is controlled via a separate fixed function device STMPE810 connected to the PIC32 via the I2C port (#2). I created a new touchscreen_StTMPE810.c module for it. The PIC32 I/O multiplexing is affected by the presence of an Ethernet PHY on board. Although not used in any of the projects of this book, this affects the PICconfig.h set of pragmas used for initial configuration (must select the RMII Alternate configuration). Finally, the VS1053 (audio chip), SD card and even the Serial Flash have been moved to the SPI1 port. This required only a small change in the HardwareProfile.c file. All in all, with the exception of the new Touch controller, it was my first encounter with such a device, it turned out to be a relatively quick porting exercise. This is testament to the flexibility and power provided by the MLA! Soon, I am going to complete the testing of all projects for the two PIC32 Mikromedia variants and I will post the new repositories and archives for you to download and enjoy. P.S. : The 4.3″ screen is simply gorgeous! This entry was posted in PIC32, Tools and tagged Mikromedia, PIC32. Bookmark the permalink.